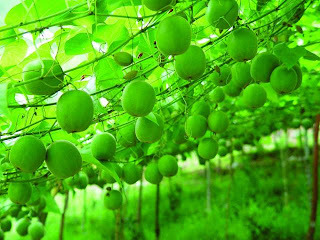 This low-calorie, low-glycemic super-fruit was discovered by Chinese monks in the 13th century. They first used it as a sweetener for their tea. It's 300 times sweeter than cane sugar, BUT Despite its sweetness, it doesn’t raise blood sugar, making it a good candidate for a natural sweetener. It is reputedly good for treating sore throats, coughs, clearing internal heat and gastrointestinal problems. And recent research has revealed that it may work as an antioxidant to help eliminate free radicals that can cause serious health concerns. Apart from its sweetness, this exotic fruit is high in vitamin C, protein and has 18 basic amino acids. Due to its antioxidant and anti-inflammatory properties, Luo Han Guo extract has been used to blend with other herbal extracts to enhance the immune system and to reduce risks of cancer. These claims, however, are still inconclusive. Other health benefits of Luo Han Guo are being investigated–among them whether mongrosides in Luo Han Guo act as potential tumor inhibitors.